This article originally appeared in the February 2017 issue of The Journal of the Delaware State Bar Association, a publication of the Delaware State Bar Association. Copyright © Delaware State Bar Association 2017. All rights reserved. Reprinted with permission. When one of my students gave me a gift of a crêpe pan several years ago, I decided to put it to good use. It would not become one of those kitchen items that sits in a cabinet just to be seen once a year. So, I decided to make crêpes for Sunday morning breakfasts…savory crêpes filled with scrambled eggs followed by sweet crêpes topped with maple syrup and berries. Below is a simple crêpe recipe intended to make two savory crêpes and two to four sweet ones. Place all of the ingredients except for the flour in a mixing bowl and whisk together. Then, add the flour and continue to whisk, eliminating any lumps. Set aside while preparing the eggs. This is how I typically make scrabbled eggs. (No precise measurements are involved…sometimes I add cheese or peppers, whatever strikes my fancy. You probably have your own technique and should use what you would enjoy tasting.) 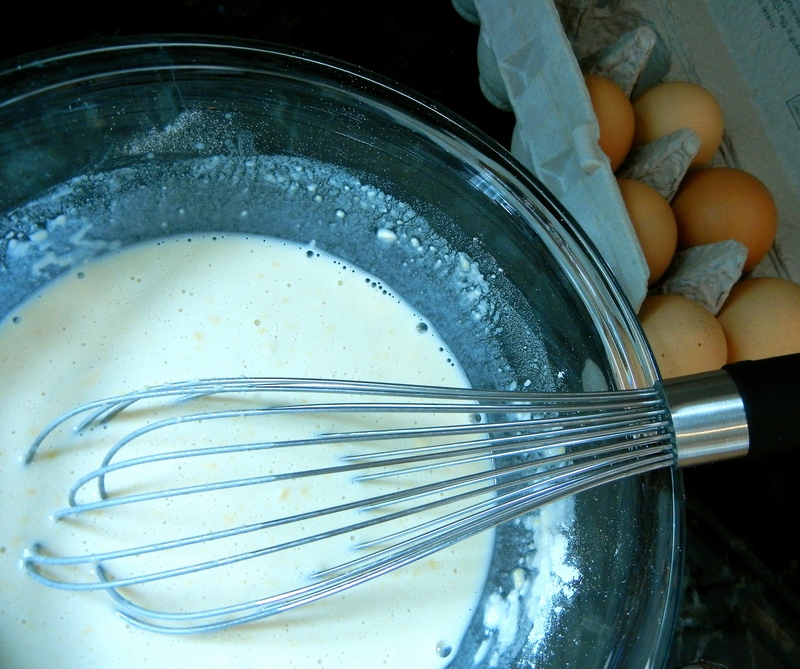 Place the eggs, milk and water in a mixing bowl and whisk together. Set aside until you are ready to scramble. This breakfast requires two pans to be working simultaneously, side by side, on the stove. The first is the crêpe pan. Place a slice of butter in the crêpe pan over medium heat. When the butter melts and sizzles, tilt the pan so that the butter moves around its bottom. Pour a large ladle of crêpe batter (just under 1/4 cup) into the center of the pan and tilt the pan around so that the batter covers the bottom of the pan. As the batter begins to bubble, move the pan forward and backward to loosen the crêpe. Lift the edges of the crêpe with a spatula to see when the bottom of the crêpe is lightly browned. Then, carefully turn the crêpe using a spatula and your fingers (or, you can toss the crêpe with a quick movement of the pan away from you then toward you). Brown the crêpe on the other side for another minute at most. Transfer the crêpe to a dish and grease the pan for the second crêpe. While working with the crêpes, prepare the scrambled eggs. Add some olive oil, sea salt and fresh ground pepper to a non-stick pan. Turn the heat to medium low and tilt the pan so that the olive oil covers the bottom. 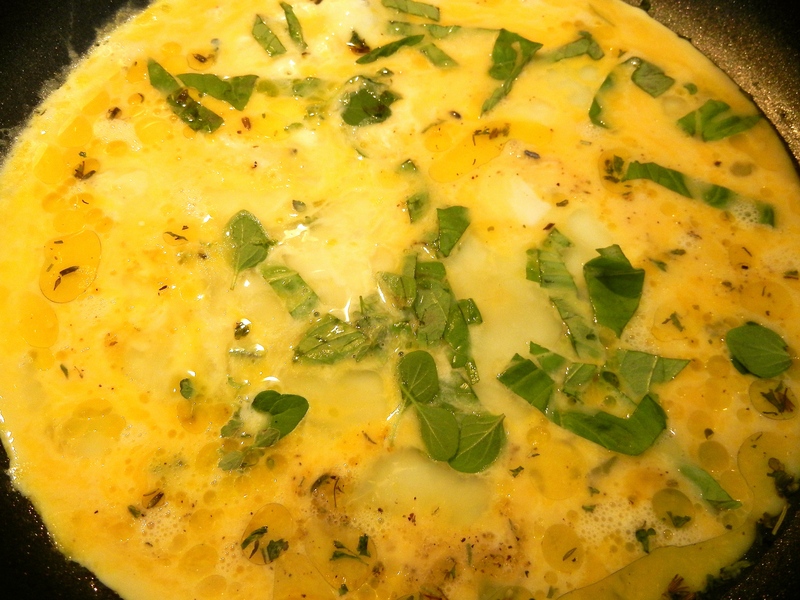 Pour the eggs into the center of the pan and add your fresh herbs. The olive oil should prevent the eggs from sticking, and as the eggs begin to solidify around the edges, use a non-stick spatula to scramble. When the eggs are finishing cooking, spoon them down the center of each crêpe. 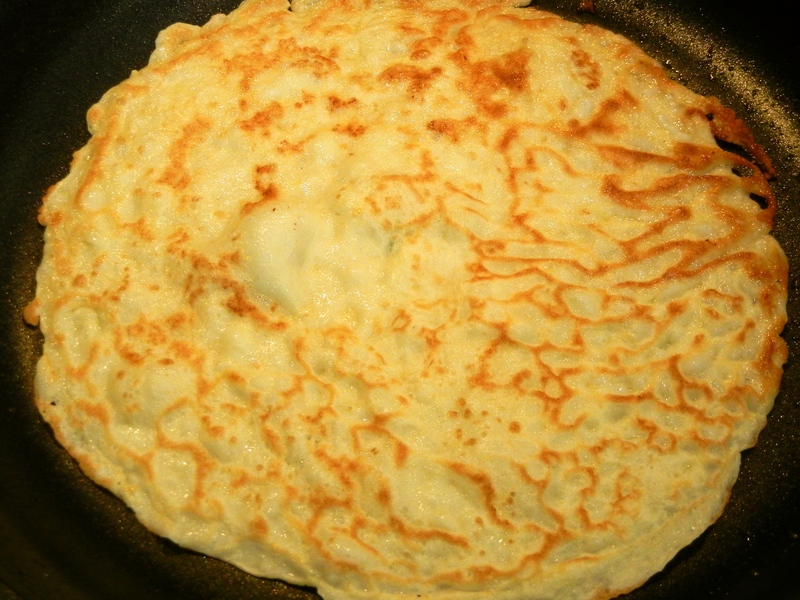 Fold the sides of the crêpe over the eggs and turn the entire crêpe over so that the “seam” is not visible. Garnish with more herbs and a drizzle of chili oil (or a flavored oil of your choice). 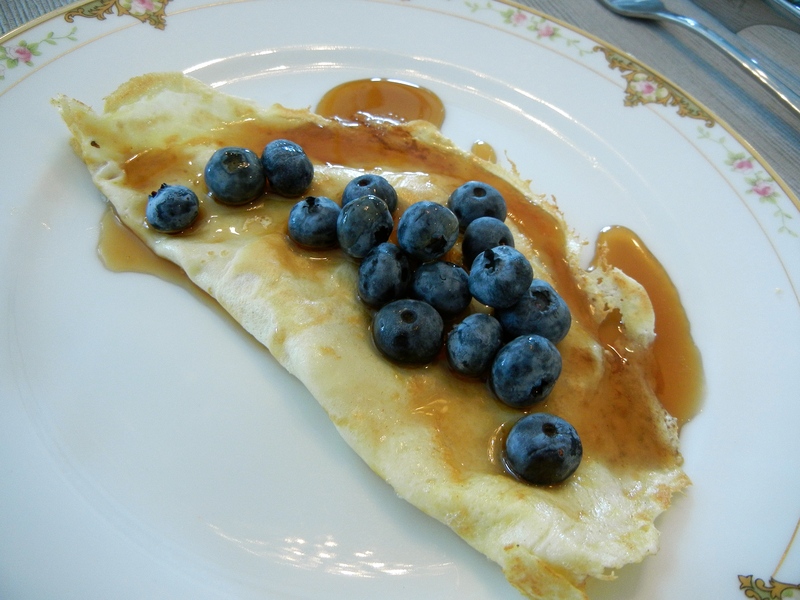 After this savory course, repeat the crêpe making process for the sweet course – crêpes topped with maple syrup (or honey) and fresh berries. Note: This also makes a fun breakfast for dinner!